Documentary filmmakers will gather at the School of Cinematic Arts at DePaul University for “Verité,” two days of events that offer an in-depth look at the filmmaking process. 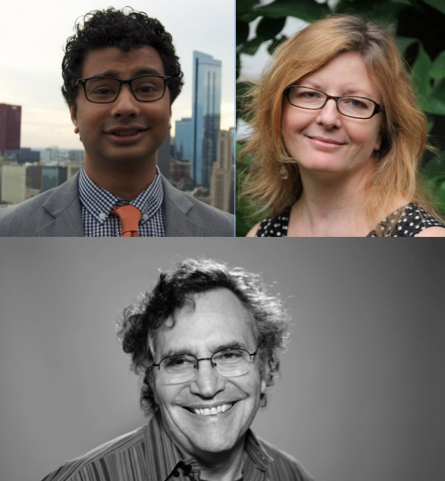 The events will feature three filmmakers from Kartemquin: Dinesh Sabu, director of Unbroken Glass; Gordon Quinn, co-founder and Artistic Director of Kartemquin and Emmy Award-winning editor Leslie Simmer. Events will be held Oct. 28-29 in DePaul’s Daley Building, 247 S. State St. Admission is free and open to the public, but seating is limited. Twenty years after the death of his parents, filmmaker Dinesh Sabu began a journey to finally piece together their story. Uncovering a silenced family history of mental illness, Sabu confronted the legacy of having a schizophrenic mother who died by suicide, the reality of growing up an orphaned immigrant, and the trauma of these events. Following the screening, experts will join Sabu for a discussion on issues of mental health in Asian-American communities. Panelists include: Barbara Harris, faculty member in DePaul’s School of Nursing. Harris in an expert on issues of chronic mental illness, women’s issues in mental health and the experience of mental illness in the community. Aruna Jha is a research assistant professor at the University of Illinois at Chicago in the Department of Criminology, Law and Justice. She is also the founder of the Asian American Suicide Prevention Initiative. Rooshey Hasnain is a clinical assistant professor at the University of Illinois at Chicago in the Department of Disability and Human Development and the undergraduate rehabilitation sciences program. Joining Sabu will be the film’s editor, Matt Lauterbach, who is an advocate for accessible media. Lauterbach served as post-production manager of Kartemquin Films during two of the most productive years in the organization’s 50 year history, escorting nine films safely to release. Lauterbach is dedicated to making the arts and digital media accessible to those with low vision and hearing. He co-directed Chicago’s first Disability Film Festival in 2015 and is now producing an interactive multimedia website called “Beyond Blind,” which addresses common misconceptions about blindness. RSVP is required for the following master classes at http://bit.ly/2dLUKf6. Gordon Quinn will discuss the relationship between the director, cinematographer and editor, as well as how the experience of taking on the different roles can influence one’s documentary work. Artistic director and founding member of Kartemquin Films, Quinn has been making documentaries for more than 50 years. In 1966, the late film critic Roger Ebert called Quinn’s first film Home for Life "an extraordinarily moving documentary." Gordon executive produced Kartemquin’s best known film, Hoop Dreams in 1994. The film follows two inner-city high school basketball players for five years as they pursue their NBA dreams. Its many honors include: the Audience Award at the Sundance Film Festival, The Robert F. Kennedy Journalism Award, Chicago Film Critics Award for Best Picture, Los Angeles Film Critics Association for Best Documentary and an Academy Award Nomination. Emmy Award-winning editor Leslie Simmer will discuss editing documentaries and analyzing editing decisions at different points in a film’s edit. Simmer is Kartemquin's Director of Editing as well as Senior Editor on staff. Her most recent project is The Homestretch, which world premiered at Hot Docs 2014. She edited and co-wrote the feature documentary As Goes Janesville a co-production between Kartemquin and 371 Productions which screened on PBS Independent Lens in 2012. Before that, she edited with Steve James on the ESPN film No Crossover: The Trial of Allen Iverson. She also edited the Emmy-nominated In the Family for which she received the Best Editing prize at the Best of the Midwest Awards. RSVP and find more information about the screening and master classes here.